Are you ready to take the Cerebra Challenge? 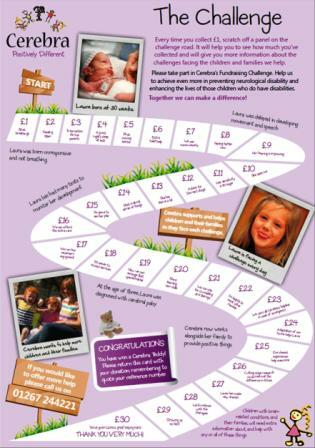 Our Challenge Cards are a great way to get your friends and family involved by making a small collection. Collecting with the Challenge Card couldn’t be easier. Every time you collect £1, scratch off one of the panels along the road. Each panel shows a new step on the road to making life a little easier for children and their families. The Challenge Card takes you on a journey along the path that children with neurological conditions and their families must face. Every day is a new challenge for them but your collection can help them.